Recently, we were hoping to eat at a restaurant and found it was closed. We'd walked by Galaxy Cafe while in The Triangle shopping center before, and decided to give it a try since we were in the area. 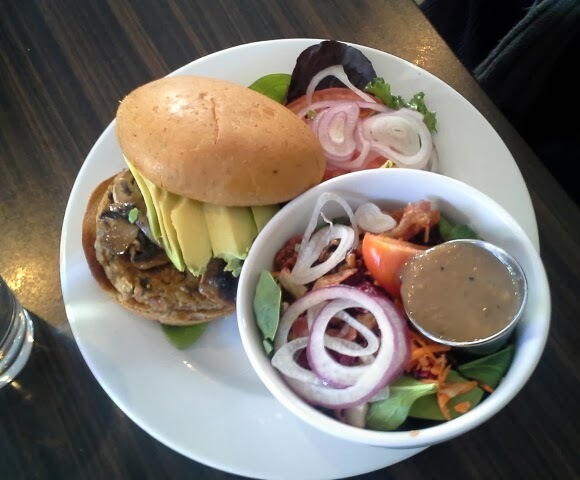 While it isn't a vegetarian restaurant, there are several options for vegetarians and some good choices for vegans. Galaxy Cafe is a lovely restaurant that strikes a fine balance between casual and stylish. Their decor has a retro yet fashionable feel, and the restaurant is open and bright. Orders are taken at the counter but brought out to you, and tables are cleared by the staff. Most entrees are priced in the $8-$12 range, though many include a side. Considering the quality of the food, the prices are quite reasonable. As you can see from the picture above, adding avocado on a burger doesn't mean a smear, it means about half an avocado cut fresh for your burger. While the vegan options on the menu are relatively limited, you can create a few more by customizing. Just read the menu carefully and be sure to ask questions. For example, the Spinach Salad comes with bacon--unless you ask for it without. The food isn't necessarily organic, but they are committed to the environment in other ways, such as sourcing local foods and using biodegradable to-go packaging. We initially came to Galaxy on a spur-of-the-moment decision (our intended restaurant was closed), but have returned multiple times, both due to the merit of their food alone and also just because they aren't as crowded as other places in the area. While they still have a nice crowd, I've rarely seen a line out the door, so it means you can have a nice meal without starving before you get it. Galaxy is very fresh and has quite a nice atmosphere, making it a fun place to eat. I highly recommend it for vegetarians, though vegans will have a few tasty options as well.